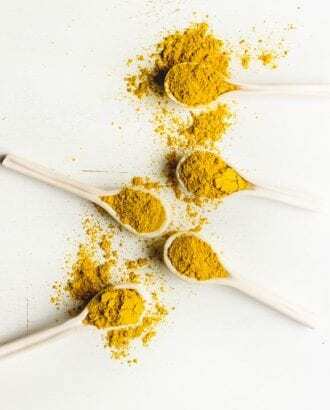 Turmeric, the vibrant yellow spice that’s commonly found in Eastern cuisine, has been on the radar of health-conscious drinkers for a while now, and that popularity that has led to an ever-growing range of turmeric beverages. From bottles you can grab at the grocery store to concentrates primed for mixing, here are some options worth checking out. This triple-pulverized, hand-blended powder yields a big boost of flavor. The blend of ginger, turmeric, malabar, peppercorn and lemongrass is bright and spicy. $25 for a packet, bighearttea.com. For fans of kombucha and drinking vinegars, this tart tonic brings raw apple cider vinegar together with cold-pressed apple and lemon juices. Turmeric slides into the forefront of the flavor, backed by cinnamon and cayenne, and overall it has enough sweetness to balance its bright notes. 6 bottles for $35, blueprint.com. Honey sets this lemonade apart from other turmeric drinks, which are often more spice-forward. Just a hint of turmeric runs through the simple recipe combining water, lemon and honey. It’s thirst-quenching and perfect for anyone new to turmeric drinks. 6 bottles for $25, honeydrop.com. Spicy, earthy flavors come together in this organic concentrate of ginger root, turmeric root, lemongrass, lemon juice and cane sugar. Drink it with equal parts sparkling water, combine with hot milk for a latte, or add a little rum or tequila to the mix to make a cocktail. $6.99, rishi-tea.com. Golden Milk is one of the most popular ways to enjoy turmeric, but if you’re not near a café and don’t want to mix one up yourself, grab this ready-to-drink golden milk from Rebbl. Made with whole turmeric, ginger and forest honey, the coconut milk-based delight strikes a great balance between coconut sweetness and herbaceous spice. You wouldn’t even realize it was dairy- and soy-free. Find a bottle. Temple Turmeric offers a good variety of turmeric drinks, ranging from raw vinegar tonics to elixirs and shots. To get a good sense of the company’s approach, start with the original elixir, a bold blend of turmeric sourced from organic farms in Hawaii and mixed with ginger, lemon, spearmint, cinnamon, cardamom and cayenne. A pinch of sea salt helps the spice profile pop, with lemon juice adding enough brightness to keep the flavors in check. Buy bottles individually, or try the best-sellers pack for $50 at templeturmeric.com. This week’s booze news: endangered sommeliers, wine resolutions and transforming food scraps into beer.